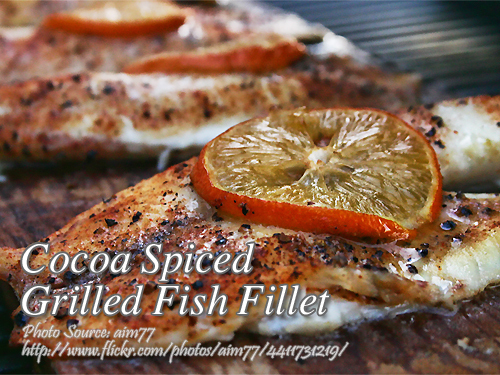 Another fish fillet recipe I have here is the cocoa spiced grilled fish fillet. The way it is prepared is making a cocoa spice mixture consisting of cocoa powder, sugar, dry mustard, cinnamon powder, paprika, chili powder, ground cumin, ground pepper and salt. The mixture is sprinkled on the fish fillet while pan grilling it. To cook choco spiced grilled fish fillet; Heat grill pan on medium-high. Smear 1 teaspoon of the olive oil on the bottom of the grill pan. Whisk together sugar, dry mustard, cinnamon, paprika, cocoa, pepper and salt. Coat both sides of the fish fillet with remaining olive oil. Place in grill pan. Sprinkle generously with the cocoa spice mixture and pat down with spatula. Grill the fillet for at least 5 minutes or until it flakes easily with a fork. Do not overcook or it will become dry. Heat grill pan on medium-high. Smear 1 teaspoon of the olive oil on the bottom of the grill pan. Whisk together sugar, dry mustard, cinnamon, paprika, cocoa, pepper and salt. Coat both sides of the fish fillet with remaining olive oil. Place in grill pan. Sprinkle generously with the cocoa spice mixture and pat down with spatula. Grill the fillet for at least 5 minutes or until it flakes easily with a fork. Do not overcook or it will become dry.